This is an on-campus degree. Nine credits of the courses in the minor must not be used to meet any other college or university requirement except the credit requirement for graduation. Pre-practicum: Students participate in a pre-practicum seminar prior to a field placement (Geron/U ST 466, 1 credit). Practicum: Students complete a supervised field practicum in Gerontology after all gerontology coursework is completed (Geron/U ST 467, 3-6 credits). 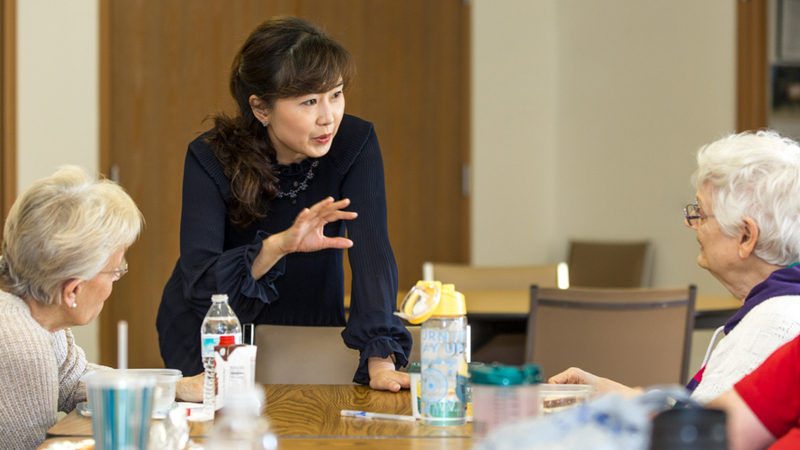 Graduate gerontology students can work with faculty on campus who study a wide array of aging-related behaviors and issues which impact individuals, families, and communities. Nine of the credits are selected from an approved list of core courses. One independent study (3 credits maximum) may be used as a core course. Gerontology 510 Seminar (1-3 credits) may also be used as an independent study. Graduate course list At least one Gerontology faculty member needs to serve on a graduate student’s program of study committee. Refer to the POS faculty page for a list of ISU Gerontology associates eligible to serve on program of study committees for graduate minor students. Doctoral students in the gerontology minor must write a section of gerontology for the preliminary gerontology doctoral examination. The faculty member who is designated the Gerontology Program representative solicits preliminary examination questions from instructors of gerontology core courses taken by the student. The designated Gerontology representative on the student’s POS committee prepares at least two questions for the student. The student has one-half day to write answers to the gerontology questions. Faculty score the written exam. The student participates in oral preliminary examination. The gerontology portion of the preliminary examination can be taken as part of the student’sdepartmental preliminary examination or on a separate day. Students must notify the gerontology representative on their POS committee of their intention to take the gerontology preliminary examination at least four weeks prior to the examination date. Students answer gerontology-related questions put forth by the designated gerontology faculty representative as a part of the oral preliminary examination. Following completion of the gerontology preliminary exam, at least two gerontology faculty will evaluate the student’s responses (the student’s designated gerontology faculty committee representative and an instructor for the gerontology courses taken by the student). The evaluators will score the written preliminary examination as either pass, fail, or pass with condition. In the event that there is disagreement between two evaluators, a third gerontology faculty member will be asked to review the answers.